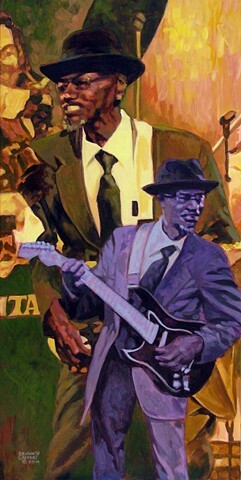 “Guitar Man” is a tribute to Bennie Smith (October 5, 1933, - September 10, 2006) was an American, St. Louis blues guitarist, considered to be one of the city's patriarchs of electric blues. His sound was emblematic of a St. Louis blues music that he helped define in over half a century practicing his trade. His contributions to the genre in that city, from the early 1950s and almost until the day of his death, included mentor, performer, and recording artist. Due to his significant contribution to blues music in St. Louis, in October 2003 he received a proclamation from mayor Francis Slay marking October 5, 2003 as 'Bennie Smith Day' in that city. The board of alderman similarly honored Smith, recognizing him as the "Dean of St. Louis Electric Guitarists". During the 2006 Big Muddy Blues Festival in St. Louis, Mayor Slay honored Bennie once again on September 2 of that year, declaring that day also be known as 'Bennie Smith Day' in St. Louis.